Hello HD117. 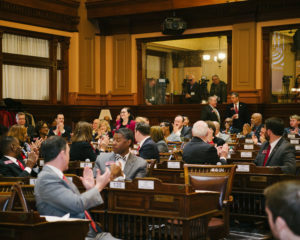 This is the first of a series of approximately weekly blogs to let you know what is going on as the legislative session progresses. Here you will find out the who, what, where, when, how and why (my reflections) of my days as your State Representative. Note: Yes, I’m a bit behind in the updates. It’s been a hectic start. These are meant as recaps but you can keep up to date on what’s going on, who I am meeting with, what legislation I’m working on and other news by Liking our Facebook page: www.facebook.com/DG4GA or following me on Twitter: @DG4GA. My colleagues welcoming me to the House of Representatives. The session began on Monday, January 8, 2018. Avery (my chief of staff) and I arrived at the Capitol, dropped our stuff at our office (CLOB 509C) and headed to the House Chambers. I was able to find my seat and my first vote was roll call. Not much else occurred in the Chambers being the first session, but I did learn about using the voting machine on my desk and calling the page (if any of you visit and I am in session, the page can ask me to come out). 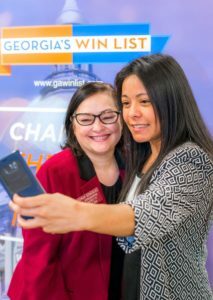 Me and Rep. Brenda Lopez at the GA Win List luncheon. 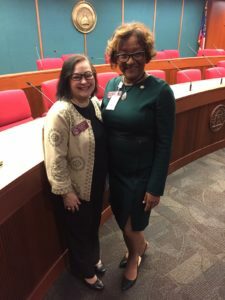 Session was followed by two lunches – one hosted by Rep. Brenda Lopez (HD99, http://votebrendalopez.com) for her interns and the second one was hosted by GA WIN (http://gawinlist.com) with their newly endorsed 2018 women candidates. 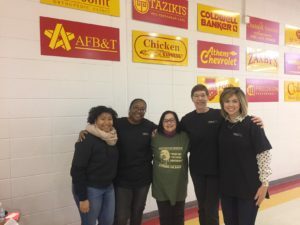 Newly elected female officials – like me, Rep. Teri Anulewitz (HD42, https://www.teriforgeorgia.com), Rep. Kim Schofield (HD60, https://www.facebook.com/electkim4d60/), and Senator Jen Jordan (SD 6, https://www.jen4ga.com) – then held an informal chat about the realities of being a woman on the campaign trail and shared lessons learned. Got back to Athens in time to get to the TAG office before they closed and ended the day cheering on the GA Bulldogs (http://georgiadogs.com) in an historic national championship game. Those players were awesome – up to the very last minute. Congratulations to each of them and their coach Kirby Smart. On Tuesday, January 9th session didn’t begin until 1 pm, but we had been hard at work already. Had two meetings before heading to Atlanta (one with a constituent and one with a legal client – yes, I am still working as I represent). One thing that happens at the beginning of every session is a mini-sermon and prayer led by the Chaplain of the Day. This is meant to inspire us as we do the People’s work. A couple of the highlights from this week include “All giants fall” and “stir things up.” I guess these Pastors knew I was in the house. Wednesday, January 10th gave me a better sense of how things would be. We began at 10 am and after the sermon and Pledge of Allegiance morning orders began. Morning orders is when representatives ask to speak for less than 5 minutes regarding an important issue or bill they are supporting. It is also during this time that members can recognize constituents from their districts for doing an exceptional thing or to acknowledge some who are visiting and sitting in the Gallery. Please make sure if you visit me to let me know so I can give you a shout out. Wednesday was special to me because it marked the first bill I signed on to. 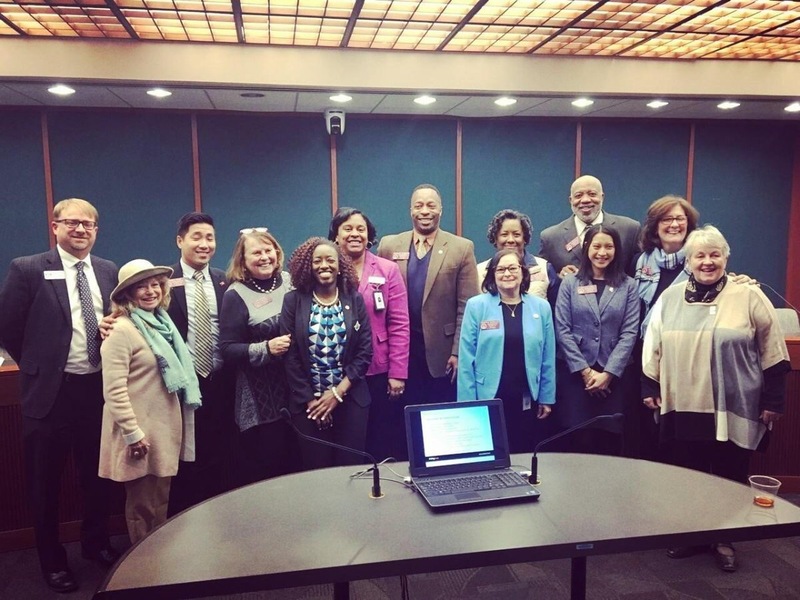 I was so honored to be invited to sign my name and support a new Hate Crimes Bill (HB663, http://bit.ly/2DnPvjj) sponsored by my friend Rep. Karen Bennett (HD64) and brought forward by the GA Legislative Black Caucus. I stood by my colleagues proudly as we held a Press Conference to introduce the bill to the public. 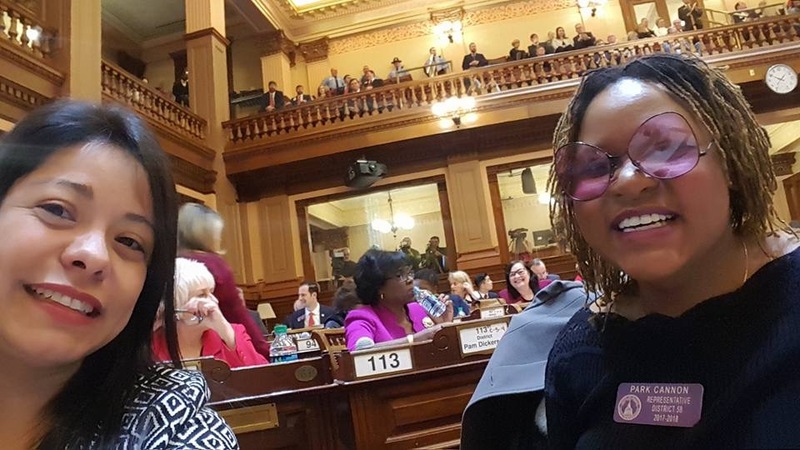 This is an important issue and the bill creates increased punishments for crimes that target an individual due to the individual’s race, religion, gender, gender identity, sexual orientation, national origin, or physical disability. Always great to meet my constituents at the Capitol. Here is Taylor Brown, Public affairs for the Park Service. Thursday, January 11th we heard Governor Deal’s State of the State Address (http://bit.ly/2Fu37u6) as well as the Democratic response (http://bit.ly/2qUH8Js). 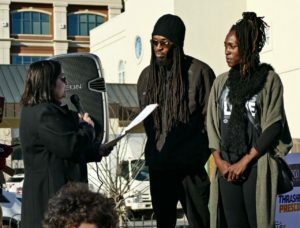 You can see videos of these speeches, as well as every session, every day on the GPB Newsmaker’s website (http://www.gpb.org/lawmakers). Governor Deal gave an inspiring message – using the metaphor of planting trees and orchards for future generations – trees and orchards of opportunity. But I also appreciate Minority Leader Trammel’s response in that not all the trees provide shade for all Georgians; something I will be working on as your representative. 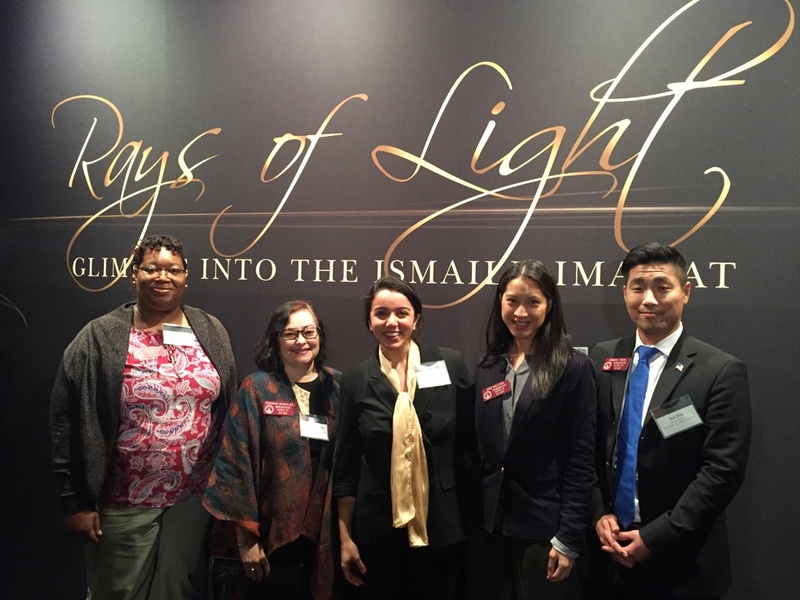 Every day is a special day at the Capitol as every day organizations visit us to provide information and to advocate for their cause. 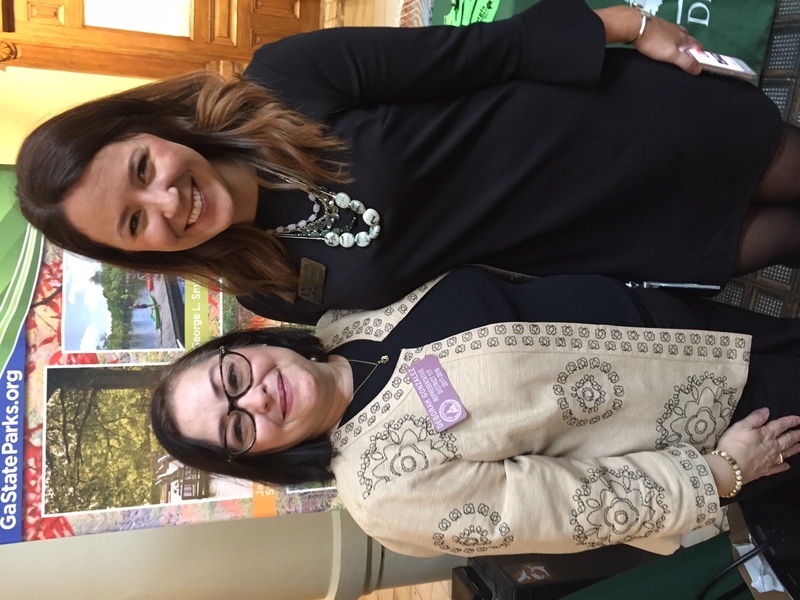 Thursday was Wildlife day and as a surprise I got to meet one of my constituents from Athens who was there representing Georgia Department of Natural Resources (http://georgiawildlife.com). Her name is Taylor Brown and we shared a hug and some conversation about how important nature and wildlife is to the fabric of Georgia. Just see of the Representatives and Senators who form part of the Working Families Caucus. 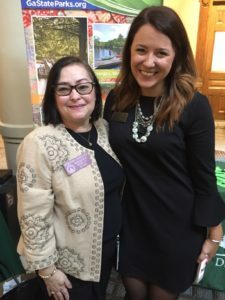 After visiting briefly the Working Families Caucus (which I am happy to say I am a member of) and meeting my official mentor (Rep. Karen Bennett, HD94, https://karenbennettcares.org), I dashed off to spend some time with the folks representing Addiction Recovery Day at the Capitol at Liberty Plaza. You may have already seen my Facebook post about this event. The stories shared remind you how strong those recovering are. 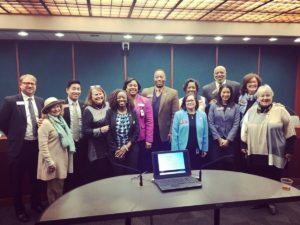 Shout outs to two great organizations doing this work – Georgia Association of Community Service Boards and Georgia Department of Behavioral Health and Developmental Disabilities. And guess what? I got to meet another constituent – HD117 is all over the Capitol – Tony Sanchez. The sponsors of the exhibit will be showcasing Ethics in Action at the Capitol – South Wing Lobby – on Monday, February 26 from 1 – 5 pm (free and open to the Public). Hope I’ll see you there. Rep. Brenda Lopez and Rep. Park Cannon try to get me in the shot. So if you are keeping track, that’s 4 days out of the 40 for session – so 36 more to go. But as you can see, being “in session” is just one part of what we do as your representatives in the Capitol. Remember this is the People’s House – it belongs to you – so I hope you will take some time, grab friends, colleagues and/or the kids, and visit us. Would love to see you there! 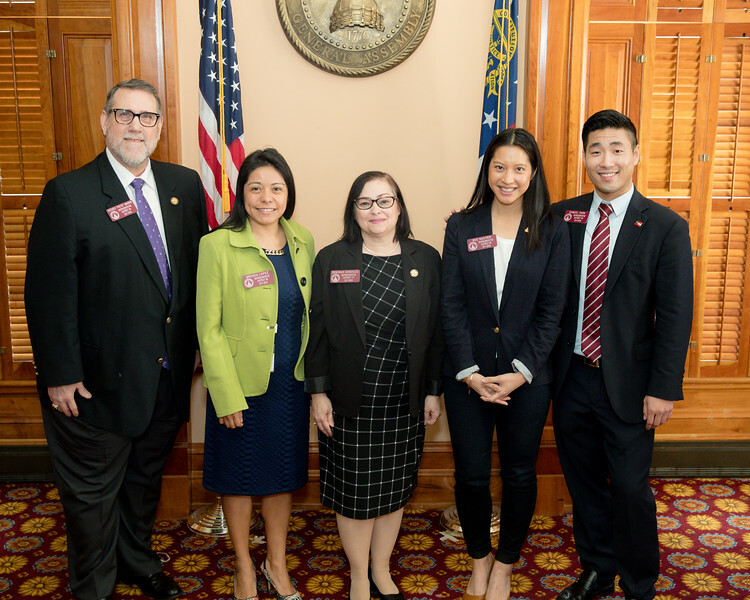 Now that the legislative session has officially begun, my House colleagues and I will be working diligently to pass meaningful legislation on behalf of all Georgians. 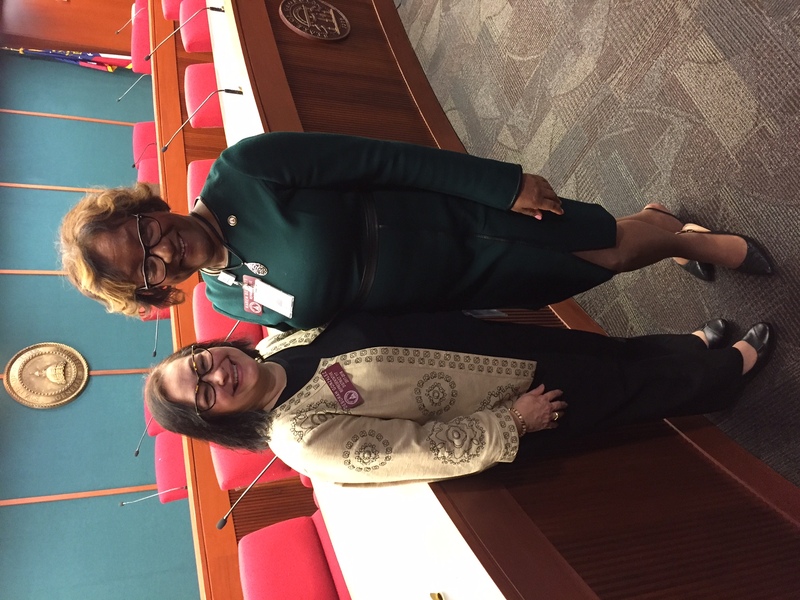 I hope that my session updates will help you to stay informed on legislative matters that impact our community and state as a whole, as well as my comings and goings on your behalf. 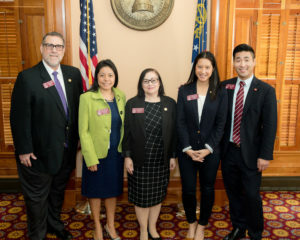 The House website, www.house.ga.gov, has several tools that might be useful to you throughout the legislative session: a live stream of House proceedings, live and archived committee meeting videos and detailed information on all legislation we are considering in the General Assembly. Being interviewed by Mundo Hispanico on the first day of Session. Call or email me if you have any questions or concerns regarding any current or upcoming legislation. My Capitol office is located in the Coverdell Legislative Office Building (CLOB) 509C, across form the Capitol, my office phone number is 404-656-0220, and I can be reached via email at deborah.gonzalez@house.ga.gov. My District Office is at the Butler Building, 337 S Milledge Ave., Suite 224, Athens, GA 30605. We are working on the scheduling of District office hours as well as community forums so stay tuned. This weekend was busy and full honoring the late Martin Luther King, Jr. By recognizing MLK Jr., we are reminded of all of the sacrifices he, and countless others, have made in their efforts to create a more equitable and just world. Honoring King encourages us to continue the efforts of those who came before us–especially those who lost everything in the process. 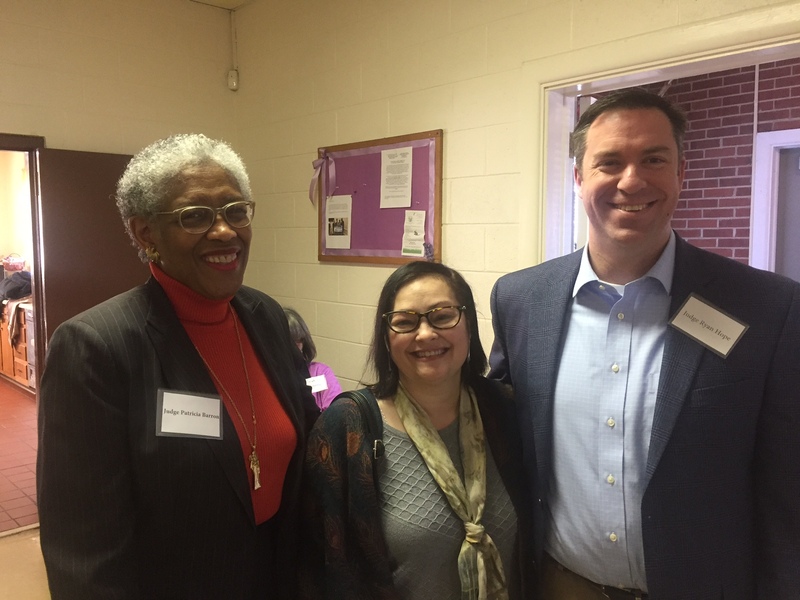 Judge Patricia Barron and Judge Ryan Hope at the Free Legal Clinic – so grateful for their service. One of MLK’s quotes making its way around social media is “It is always the right time to do the right thing.” I couldn’t agree more. On Saturday, January 13th, various district judges and attorneys offered their services for free at the first Pop-Up Legal Clinic held at the AME Church on Hull Street. 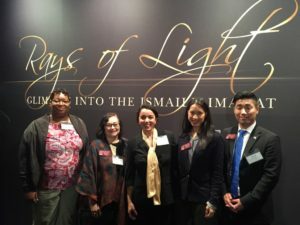 Organized by the Access to Social Justice group, it offered the community and opportunity to speak to an attorney or judge about a particular legal issue at no cost. The next one is Feb. 24th at the Athens Regional Library on Baxter Street. fierce performers at the Lydon House. 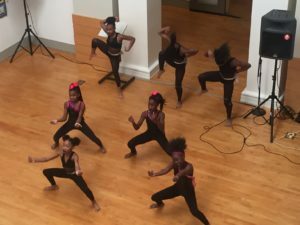 Later that day the Lyndon House in Athens celebrated Visions of MLK with song, dance and poetry. 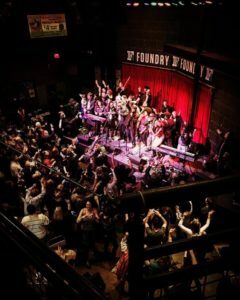 Now in its 7th year, the celebration is as vibrant and essential as ever. The Reverends do a mean duet to preach the message of inclusivity. 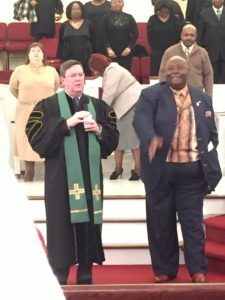 Sunday, January 14th offered a variety of events starting with a joint service held at the Mount Pleasant Baptist Church whose congregation welcomed those from the Milledge Avenue Baptist Church. The inspiring service was followed by a fellowship lunch. From there I enjoyed a Voices of Truth Concert at the First Presbyterian Church of Athens. I really do not have a voice for singing, but gladly it didn’t matter. I let the professionals do it and I find Gospel music to be so moving. It seems like all of Athens came out and rocked the house. Bob joined me Sunday evening for the Athens in Harmony concert organized by Knowa and Mokah Johnson to benefit the Athens Anti-Discrimination Movement. This is the third year and should not be missed – ever. It showcased a number of duets by local musicians. There were so many highlights I’ll let the photos and Facebook posts do it justice. MLK Day on Monday, Jan. 15th started early at the Clark Central High School for the MLK Day of Service Kickoff. We had over fifty volunteers come in to set up for hundreds of volunteers to go out to different sites. T-shirts, breakfast and inspiring words from Ovita Thornton sent them all out with a bang. 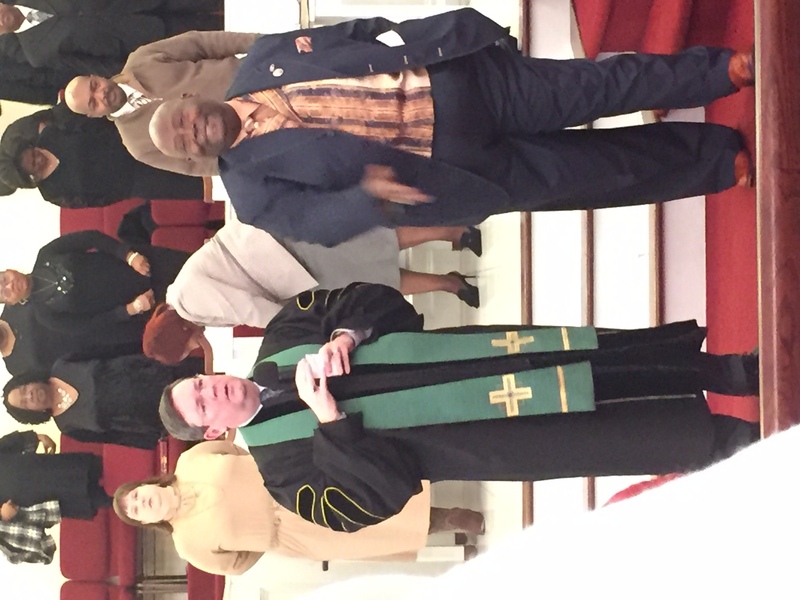 Midday saw me in Barrow County at the White Oak Spring Baptist Church in Winder for their MLK service. Bringing together local elected offices – the mayor, city commissioners, and law enforcement – to join the congregation in celebrating the life of MLK and urging all to follow in his footsteps – the event was one I will not miss next year. First ride in a parade and in a convertible! With Rep. Jonathan Wallace. My last event for MLK that Monday was the Athens MLK Parade and Festival. Such a wonderful way to recognize the many great people doing so much great work in our local communities! Thank you to Jonathan Wallace, my legislative colleague in District 119, for joining us! 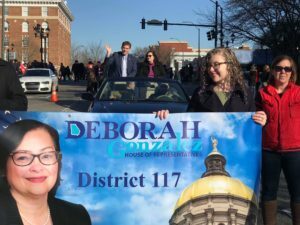 I also met up with friends such as Beto Cacao, Ovita Thornton, and Moms Demand Action – GA. And a huge “Thank You!” to the awesome Adam Shirley and Emily Myers, Stephanie Flores, and Cary Lynne Thigpen for marching in the parade with me and being such a wonderful part of the community of Athens, GA! 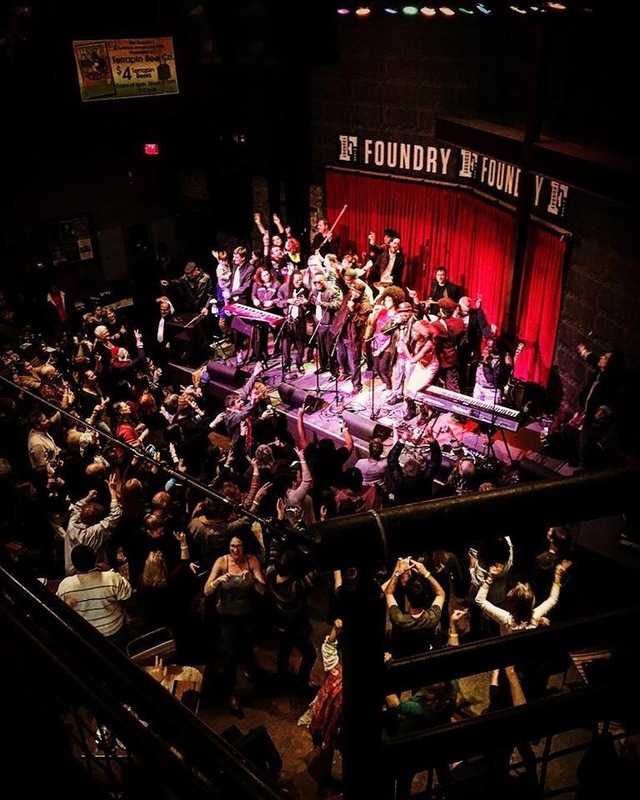 Know Johnson and Mokah Johnson – two outstanding citizens of Athens, GA! After the parade I had the honor to present to Knowa Johnson and Mokah Johnson a GA House Resolution that commends and honors their work. You can find a video, photos and the text of the resolution on our Facebook post about the event: http://bit.ly/2FMav3Z. Thanks so much for all you are doing! So wonderful to see you fighting for Medicare expansion and a hate crimes bill.